Over the past weeks I have written so much about the anti-adaptational effects of ROS-scavengers that I probably don't have to mention the impressive (for some people shocking results) of the 2009 study by Ristow et al. with the telling title: "Antioxidants prevent health-promoting effects of physical exercise in humans" (Ristow. 2009) to underline that not everything is gold that comes in yellow packages and is labeled w/ vitamin C. Much contrary to the yellow, orange, red, green and blue natural vitamin C sources from the super- or farmers-market, by the way. Before I get lost in the hormesis debate, I do yet want to adopt to a more general, non-exercise related perspective to check, if the impairment of exercise-induced improvements in insulin sensitivity is the only interaction between vitamin C and glucose metabolism. And I guess I am not giving away too much if I tell you that there is a plethora of research on the effects of vitamin C in those whom we are about to call "Average Joes & Janes" in roughly 10 to 20 years - the obese diabetics. "people with diabetes mellitus to have at least 30% lower circulating ascorbic acid concentrations than people without diabetes mellitus" (Will. 1996). This does not mean that the provision of extra vitamin C to diabetics was useless, though. By re-establishing an improved free-radical balance the extra ascorbic acid did reduce the levels of cellular sorbitol concentrations and ameliorated the overall increase in capillary fragility. Once and for all - Vitamin C is ascorbic acid - This does necessarily entail that it does not matter whether the guys who produced the pills you are popping claim to have gotten their raw material from kiwis, oranges, or your grandma's favorite saussages (yes, vitamin C is a commonly used preservative) - it will all have the same often overhyped effects on your health. If there was any way to actually produce "natural" vitamin C with certain "improved" effects on your health, it would be by combining it with other plant molecules you would usually find next to ascorbic acid in high vitamin C foods... and how do you do this? You simply eat your 100g of guava to make sure you covered your daily allowance for the next 5 days or pick any of the other foods in the table to the left. Vitamin C is the "old vitamin D": For both scientists and laymen have long been confusing cause (increased inflammation) and effect (reduced ascorbic acid / 25OHD levels). With only 286 subjects in ten randomized controlled trials comparing antioxidant vitamin-supplemented and control groups being reviewed, we do yet have to be careful not to overestimate the results of this meta-analysis by scientists from the Avignon University, the Maastricht University Medical Centre and Cardiovascular Research Institute and, last but not least the Department of Internal Medicine at the Brigham & Women's Hospital in Boston (Montero. 2014). Still, the fact that most studies reporting (often non-significant) benefits in fasting blood glucose (e.g. Vaksh. 2013 - 1,000mg vitamin C) have been conducted in labs with a low international reputation and published in journals with no or only minimal peer-reviewing does not exactly strengthen my confidence that vitamin C has any direct beneficial effects on glucose control in type II diabetics (this does not mean that it wouldn't be a good idea to use vitamin C as a means to reduce the cytotoxicity associated with hyperglycemia in prediabetes and type 2 diabetes; cf. Franke. 2013). The skinny on vitamin C - some general remarks: Vitamin C is an essential dietary nutrient for the biosynthesis of collagen and a co-factor in the biosynthesis of catecholamines, L-carnitine, cholesterol, amino acids, and some peptide hormones. The lack of vitamin C causes scurvy, a pathological condition leading to blood vessel fragility and connective tissue damage due to failure in producing collagen, and, finally, to death as result of a general collapse (Grosso. 2013). Outside of the "older individual" scenario reported benefits are yet rare. In contrast to the consumption of obviously vitamin C containing foods like green leafy vegetables, which is associated with a 14% reduction in risk of type 2 diabetes (Carter. 2010), the evidence for benefits in glucose management and reductions in type II diabetes risk from supplemental vitamin C in healthy, young individuals is scarce to non-existent and the presence of these effects a "‘nutraceutical’ industry-driven myth which should be abandoned." It is, and that's true beyond the context of women's health, "a myth in need of urgent burial" (Talaulikar. 2011). Loss of natural synergists in food: The antioxidants in fruit and vegetables may be tightly bound within the tough fibrous material of these foodstuffs and may exert their antioxidant activity not in the blood or tissues but in the gastrointestinal tract where free radicals are constantly generated from food (Halliwell. 2008). Supplements, on the other hand, are probably digested too quickly to replicate the effect. Limited increase in serum vitamin C levels from oral supplement: Elegant studies by Lean et al. (Lean. 2003) showed that oxidative stress plays a crucial role in oophorectomy-induced osteoporosis in mice, and that vitamin C will prevent the development of osteoporosis when given intraperitoneally at a dose of 1 mmol/kg twice a day. The human equivalent of the vitamin C dose they used is 20 g per day. The equivalent serum levels of vitamin C cannot be achieved if the supplement is given by the oral route, since there is an upper limit for absorption of vitamin C of about 500 mg, which is why this is normally the highest dose given. Any more vitamin C stays in the gut and may cause osmotic diarrhoea and other gastrointestinal upset (Institute of Medicine - US. 2000). The last factor, i.e. the oral bioavailability or, more precisely the effect of supplemental vitamin C on serum ascrobic acid levels is a commonly overlooked factor which could in fact be similarly important as the previously mentioned lack of synergists. Figure 1: May. plasma vitamin C concentrations (mmol/in healthy subjcets after oral or intravenous administration of vitamin C (large graph); the small graph shows the time-response w/ oral supplementation (Padayatty. 2004). As you can see in Figure 1 oral supplements cannot increase the plasma vitamin C concentrations into the mmol/l range. Vitamin C concentrations as they have been reported to be cytotoxic to various malignant cell lines can thus not be achieved by via the oral route (Padayatty. 2001). It is thus not only very unlikely that you can "kill" cancer cells with tons of orally administered vitamin C. It could also put you at risk of an unwanted increase in pro-diabetic dehydroascorbic acid (oxidized = used vitamin C; cf. Patterson. 1950) and the corresponding negative consequences on glucose control. Even if we discard reports by Podmore, et al. who warn that supplementing with more than 500mg of vitamin C will result in significant increases in pro-oxidant 8-oxoguanine and 8-oxoadenine concentrations and an increase in a potentially mutagenic lesions following high dose vitamin C supplementation (Podmore. 1998) or the copper-depleting effects of vitamin C (Lönnerdal. 1996), which could well be accelerated by and in turn accelerate the obesogenic effects of the standard western diet (Song. 2012), the mere inefficiency of high dose oral vitamin C supplements should be reason enough to stay away from doses in the multiple gram range. Before I close today's installment of the "There is More To Glucose Control Than Carbohydrates"-Series I do have to briefly get back to the potential negative effects of vitamin C for pro-athletes and wanna-be-athletes. While there is good evidence that the provision will blunt the long term adaptation, it's not as if you would have to avoid a eating a cup of cherries before or after the workout, because their vitamin C content could hamper the post-exercise increase in insulin sensitivity. As a SuppVersity reader you know that these acute effects, of which Christina Yfanti and her colleagues from the University of Copenhagen have been able to show that they are not blunted by the provision of 500mg of vitamin and 400IU of vitamin E over a 16(!) week period (see Figure 2). Eventually, this conservation of the beneficial effects on glucose uptake in the presence of medium amounts of supplemental antioxidants is only logical: The training, a program consisting of intervals (intensity 75–91% Pmax and duration 60–80 min) and continuous biking (intensity 55–66% Pmax and duration 85–155 min) is after all more than intense enough to lead to the AMPK increasing decrease in ATP/ADP ratio which is responsible for the non-glucose and only partially insulin dependent increase in glucose uptake after a workout. 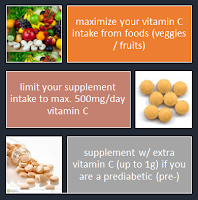 Three simple rules of reasonable vitamin C intake / supplementation. Bottom line: The current evidence appears to suggest that the ingestion of a total of 100-500mg of vitamin C and thus significantly more than the official US RDA (60mg) offers nothing but benefits - specifically if the lions-share of ascorbic acid comes from high vitamin C foods, like fruits and veggies. The consumption of copious amounts of supplemental vitamin C (750mg+ per day), on the other hand, must be treated with caution. 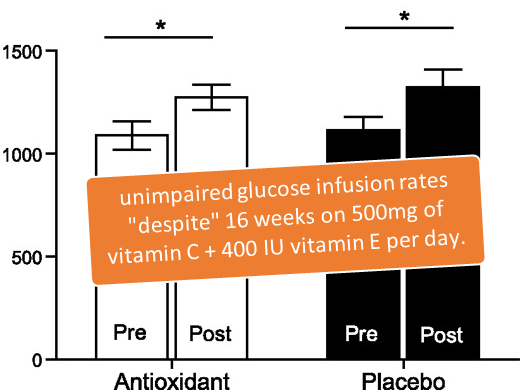 In spite of the fact that there is little evidence of vitamin C induced improvements in glucose management, there is plenty of evidence to support the notion that the extra vitamin C can ameliorate the collateral damage that occurs as a consequence of the increase in glucose levels in insulin resistant / diabetic individuals. Domínguez-Perles, R., et al. 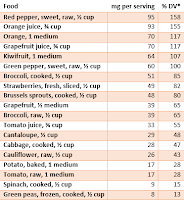 "Brassica Foods as a Dietary Source of Vitamin C: A Review." Critical Reviews in Food Science and Nutrition just-accepted (2013). Franke, Silvia Isabel Rech, et al. "Vitamin C Intake Reduces the Cytotoxicity Associated with Hyperglycemia in Prediabetes and Type 2 Diabetes." BioMed research international 2013 (2013). Grosso, Giuseppe, et al. 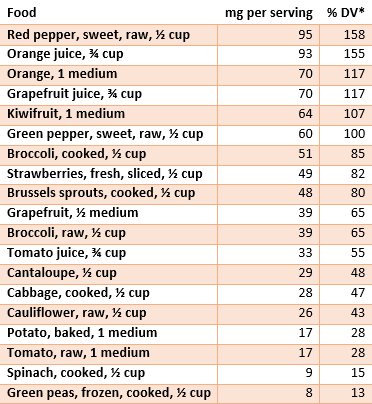 "Effects of Vitamin C on health: a review of evidence." Frontiers in bioscience 18 (2013): 1017-29. Halliwell, Barry. "Are polyphenols antioxidants or pro-oxidants? What do we learn from cell culture and in vivo studies?." Archives of biochemistry and biophysics 476.2 (2008): 107-112. Institute of Medicine (US). Panel on Dietary Antioxidants, and Related Compounds. Dietary Reference Intakes for Vitamin C, Vitamin E, Selenium, and Carotenoids: A Report of the Panel on Dietary Antioxidants and Related Compounds, Subcommittees on Upper Reference Levels of Nutrients and of Interpretation and Use of Dietary Reference Intakes, and the Standing Committee on the Scientific Evaluation of Dietary Reference Intakes, Food and Nutrition Board, Institute of Medicine. National Academies Press, 2000. Lönnerdal, B. "Bioavailability of copper." The American journal of clinical nutrition 63.5 (1996): 821S-829S. Montero, D., et al. "Effect of antioxidant vitamin supplementation on endothelial function in type 2 diabetes mellitus: a systematic review and meta‐analysis of randomized controlled trials." Obesity Reviews 15.2 (2014): 107-116. Padayatty, Sebastian J., and Mark Levine. "New insights into the physiology and pharmacology of vitamin C." Canadian Medical Association Journal 164.3 (2001): 353-355. Padayatty, Sebastian J., et al. "Vitamin C pharmacokinetics: implications for oral and intravenous use." Annals of Internal Medicine 140.7 (2004): 533-537. Patterson, John W. "The diabetogenic effect of dehydroascorbic and dehydroisoascorbic acids." Journal of Biological Chemistry 188 (1950): 81-88. Vaksh, Shreyasi, et al. "The Effect Of Vitamin-C Therapy On Hyperglycemia, Hyperlipidemia And Non High Density Lipoprotein Level In Type 2 Diabetes." Int. J. LifeSc, BT and Pharm. Res (2013): 290-295. Song, Yiqing, et al. "Multivitamins, individual vitamin and mineral supplements, and risk of diabetes among older US adults." Diabetes care 34.1 (2011): 108-114. Song, Ming, et al. "High fructose feeding induces copper deficiency in Sprague–Dawley rats: A novel mechanism for obesity related fatty liver." Journal of hepatology 56.2 (2012): 433-440. Talaulikar, Vikram Sinai, and Isaac T. Manyonda. 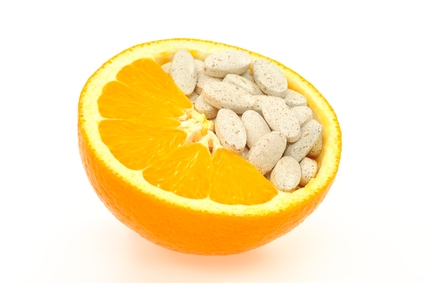 "Vitamin C as an antioxidant supplement in women's health: a myth in need of urgent burial." European Journal of Obstetrics & Gynecology and Reproductive Biology 157.1 (2011): 10-13. Will, Julie C., and Tim Byers. "Does diabetes mellitus increase the requirement for vitamin C?" Nutrition reviews 54.7 (1996): 193-202. Yfanti, Christina, et al. "Effect of antioxidant supplementation on insulin sensitivity in response to endurance exercise training." American Journal of Physiology-Endocrinology and Metabolism 300.5 (2011): E761-E770.